Blogging is a crucial part of any online business. Both beginner and advanced bloggers actively seek for blogging tips to help them improve their blogs. No matter whatever you sell online (or offline) having a blog highly boosts the value of your website. Rather than having a simple landing page that talks about you and your company, a blog gives you a great chance to publish awesome, useful content for your readers. But without proper knowledge about the stuff involved in blogging, you are prone to fail (not trying to scare you). The blogging tips I share in this post will not only help beginner bloggers, but will also be useful to experienced bloggers. Let’s get started with tips for good blogging! It really boils down to this question: Why do you want to start a blog? Without having clarity about the purpose of your blog, please remember that your blog is bound to fail. I am not trying to discourage you or scare you here! But that’s the plain truth. Sit down and think about why you are starting this blog in the first place. Once you get a clear picture, write it down and keep it in a place where you often see it. From now on, whatever you do with blogging should be to fulfil that purpose. Anything else you do is pure waste of time! Once you have a purpose or goal in mind, it is time to devise an action plan. Your goal is your destination. Your action plan is the map that tells you how you are going to achieve that goal – to reach that destination. Without a clear action plan, you might be wasting a lot of time on doing things that actually don’t contribute to moving the needle towards your goal! You might want to tweak your action plan as you move and as you learn/measure things – that’s totally OK.
What matters is that you have an action plan in place. Identifying your blogging purpose and devising an action plan are just the starting point. But what will make sure that you stick to the plan is the tools/systems you use. Without a proper system in place and without the use of right tools you will not be able to follow your action plan to achieve your blogging purpose. And that could be pathetic. Because that’s what makes most bloggers quit – they don’t have the right tools in place. They do everything the hard way, and not the smart way. They lose control of stuff. They don’t know how to manage things in the long run. Having a blog means publishing awesome content. Publishing high quality content. But that doesn’t mean “any” content. Every piece of content you publish should align with your blogging goals. It should help you with conversions. You know what you want your readers to do after they arrive at your blog, right? Perhaps you want them to sign up for your newsletter. Or you want them to buy your ebook. Whatever it is, every piece of content you publish should act as a funnel to get that goal accomplished. As I said earlier, tools play a crucial role in helping you progress towards your goals. And if you are ignorant about the tools or refuse to use them for any reason, you will miss out big. You need to catch up with technology and start using the tools. For instance, in order to capture blog post ideas you might need a solution like Evernote. In order to launch a beautifully designed, search engine optimised website, you will need a framework and/or theme like Genesis Themes or Thrive Themes. In order to place beautiful and highly converting optin forms, you will need a solution like Thrive Leads. 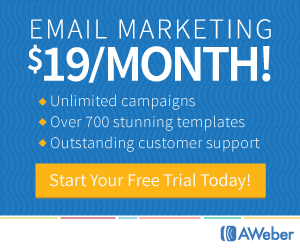 In order to capture emails, segment them, maintain them, send them useful content on a regular basis, you will need an email marketing solution like Aweber. If you fail to use the right tools, it will be highly challenging and even impossible to get your stuff done. Let’s admit it. Even though you are all passionate about blogging and your business, there are certain tasks that are totally mind-numbing and boring. After all blogging incorporates a lot of things – you enjoy some. While you do some out of compulsion. Consider outsourcing those kind of tasks that you don’t enjoy. By outsourcing a few tasks you will have some extra time on your hands for doing things that you actually enjoy! Never ever compromise on the quality of content! This is my strong advice to you. It is not the amount of content you publish but the quality of content that matters. Keep this in mind throughout your blogging journey and only create and publish content that is of high quality. For the same reason you must set realistic publishing goals. Don’t promise yourself to publish one blog post every day – as you might burn out soon, or run out of ideas soon or just lose motivation in the long run. If you have a handful of guest bloggers willing to write for you, publishing every day could be possible. But if you are the only one creating content for your blog, only take up as much as you can produce without compromising on the quality. I strongly recommend you to take up my content writing course: How to create great content for your business? Just in relation to what I said above, staying consistent is another important factor. Don’t jump with excitement soon after you launch a new blog and start publishing content every day. Over the time, you might burn out and might not be able to keep up. Publishing 5 blog posts a week for 1 month and then going MIA for a few months isn’t going to cut it! Only with consistent efforts you can succeed with blogging. Not just with publishing content, but this advice applies to whatever you do with blogging. Only by being consistent you can scale up results. Otherwise you might see some spikes (of traffic, subscriptions, sales or whatever) and that will settle quite soon. That’s not what you want. You want results that consistently grow and scale up! I totally understand that you might hate SEO altogether. Especially when you are a beginner, SEO can be overwhelming – both to understand and also to keep up! But here’s another harsh truth – you must embrace SEO. You don’t have to go for any advanced SEO tips. Just have an idea of the basic SEO tips and implement them on your blog, right from the start. SEO not only helps to rank your content better in search engines, but it also helps your readers find your content. After all you want your readers to find your content, read it, appreciate it and convert. It all starts with your readers finding your content. Of course they can find you via social media, email and other means. But those traffic are momentary. The moment you publish a post and hit a few shares, you will get a spike in traffic. But that traffic usually fades off. Similarly when you send out a newsletter you will get a spike – but you cannot expect that to be consistent. Only search engine traffic will help you in the long run. Initially it could seem hard to understand and implement SEO techniques. But once you do things right, in the long run, you can pretty much enjoy the search traffic (almost) hands free. Blogging and networking go hand in hand. In the sea of big companies, bloggers and loads of content, you need to have extra hands to help you out. Be it promoting your blog posts, offering you guest posts and guest post opportunities, helping you with launches – you need fellow bloggers to help you out. They also help you by offering great suggestion, and motivation and trust me you need these on a regular basis. So start networking right from the beginning! You will not regret. Personally, I find networking to be the wonderful part of my business – a stress free thing that I can do on a regular basis. It is not something tough, or something that feels like “work”. At the same time it pays off really well! But just make sure you don’t hit up people for selfish reasons. Build genuine relationships and see what follows! This is a dumb mistake I myself made when I started out back in 2007. Somehow I thought that I should only start building a list when I get a certain number of visitors to my site. At that time, in the first month I was getting about 100 visits per day. And I waited out. I did not do anything to build an email list for about 2 years! Can you imagine how many subscribers I just left out? And when I decided to put up an optin form, I got 82 signups within a few hours. I now realise that mistake and never will make it again. Clutter is dangerous. It can instantly turn people off your site! And there are numerous beautifully-designed, visually appealing, clutter free websites on the internet. People are used to visually pleasing web pages – and anything with clutter is going to be a strain on their eyes. Especially as more and more people are using mobile devices to access the internet, it is very important to go clutter free. Analyse your website and see if there’s anything that’s annoying – this includes annoying pop-ups (not all pop-ups), ads that are cluttered on the website, unnecessary widgets, use of too many colors – I can go on. But you get the idea. This post will be an additional help in this context. You blog to attract visitors. You get traffic. But what if that traffic just comes and goes by? That’s wasted traffic, right? You absolutely cannot afford to waste all your hard work to get traffic and then let it slip by without taking any action. You got to take all measures to convert your traffic. So what’s conversion? It could be anything depending upon your blogging purpose. It could be that you want your visitors to sign up for your newsletter – in which case you must put up sign up forms at appropriate places. If it is about your product sales, you need to put up call to actions inviting people to check out your product/services at appropriate places in your website. One of the easiest ways to emphasthize with your readers and to make them relate to you and your content is to answer your readers’ questions directly. And by answering your readers’ queries directly, you also make your blog’s content highly useful. After all if readers can find answers to their queries on your blog, they are simply going to love that! It is highly crucial for you to keep yourself updated. You should be up-to-date with happenings in your industry, as well as anything related to your online business. For instance if you run a fashion blog, you should keep yourself updated on the latest fashion trends. And at the same time, you should keep tabs about any search engine updates, a new SEO technique, a new feature or a theme released for fashion bloggers and so on. This will help you stay on top and keep up with your competitors in implementing new things. Blogging is not something you do one off and reap the benefits. And it is not something that will give you instant results. It will certainly take some time for the results to show up (if you’ve been told/promised otherwise, you’ve been hearing the wrong advice). You must keep this in mind when you start with blogging, because most bloggers have wrong notions about getting there. They expect results too soon, and when they don’t get it, they become frustrated. And decide to quit. In order to keep your motivation up and in order to keep working on your blog with focus, you need to be patient – and have realistic expectations about blogging success. Your site should have certain important pages like About, Contact, landing pages etc. When you launch your blog you should make sure that these pages are complete and more importantly, up-to-date. If these pages are totally absent, your readers will find it hard to know about you, connect with you and so on. And as per guidelines for content you need to have some of the pages like Privacy, Disclaimer etc. on your website. So you must make sure you have these pages always ready and updated. It is OK to monitor and follow your fellow bloggers – to know their strategies, to get inspired and so on. But if you are going to imitate their voice just because that voice of theirs is successful, you are making a big mistake. Their voice works for them and for their business. And I am sure it will not work for you. Don’t ever compromise on that! So you might start a blog, publish a few blog posts, do social shares and network with people. But how are you going to measure the results you get? How would you know what strategy works and what doesn’t? Only by knowing what works (and that too by numbers) will only enable you to do more of what works and drop anything that isn’t working. You can only unveil working strategies and identify non-working strategies if you measure results. By all means use the right tools that help you clearly measure your goals and results. Use Google Analytics for keeping tabs on traffic, track your income/sales, and track your signups/conversions. Without this knowledge, it is pretty much hard to improve in your blogging business. With blogging, consistent content creation comes a crucial thing. And in order to create content consistently, you should have a list of blog post ideas ready. Else, you will certainly hit the writer’s block syndrome. And it is dangerous in the long run. Over the time, this can lead to frustration and even quitting – being unable to create content consistently. So by all means, have a tool to capture blog post ideas. It can be a tool like Evernote (which I personally use), or as simple as a notebook and pen. Just have one tool for idea capture – don’t have your ideas scattered all over the place since that will totally defeat the purpose of idea capture. Your blog is your space where you share awesome content and connect with your readers. But don’t stop there. You should actually be actively reaching out to readers outside your blog since that gives a greater chance of discovering new visitors by actually visiting those places where they hang out. Examples include other blogs (in the form of guest posts, blog comments), social media (responding to updates, participating in group discussions, sharing others content etc. ), interacting in blog communities like DoSplash, Klinkk and so on. The internet is loaded with content, and a lot of visually engaging stuff. Now your content should be such that it doesn’t overwhelm your (already overwhelmed) readers; and at the same time stand out and feel easy on the eyes of your readers. This can be accomplished by formatting your content properly. Nothing so techy about this – you just have to use sub-headings, bullet points, images, paragraph breaks and the like! That’s there all to how to write blogs, seriously! Shares on your content help spread the word, and yes a great source of traffic. Social sharing not only helps you build buzz and attract traffic, it can help your content go viral. This is a big plus! But you have to help your readers to share your content. Of course the first step here is to create awesome content that your readers would want to share. But the next important step is to make it easy for your readers to share your content by putting social sharing buttons at appropriate places on your content. I’d suggest both at the top and bottom of your blog posts. This way your readers can share away just with a click. I highly recommend Social Warfare plugin for this purpose. Evergreen content is something that is not news-like. The tip or advice or suggestion or the discussion you make in a piece of evergreen content applies to the current date and also to a future date. It is something that stays fresh for a long time. By creating evergreen content you also do yourself a favour – that particular piece of content that you’ve worked hard on can help you bring fresh readers in a consistent manner. You also do your readers a favour by providing them with such content. And such content will form pillar content for your blog, that you can often refer to in your blog posts, promote in guest posts, and put up as links in navigation or sidebar. And yes, evergreen content helps strengthen the SEO of your site in general. As a blogger you will certainly have a lot on your plate. It doesn’t matter if you are a full time blogger or a part time blogger, finding the time to blog can be quite challenging. For a part time blogger, the day job will already take up a lot of time and energy, leaving very less of those for blogging. For a full time blogger, overwhelm and other challenges (like household chores, screaming kids, people interrupting all the time and so on) make it challenging to work on their blogs. You cannot find the time, but you have to make it. When you start out as a blogger, or when you have not yet reached your goals, it could be highly tempting to fake it. Publishing fake income reports, fake success stories etc. are some of the examples. But here’s the thing – your readers are smarter than you think and they can smell your fake-ness right there. And being honest never hurts. Your readers will love you for being honest. In fact honestly letting them know what didn’t worked for you or how you failed terribly on something will be really useful to your readers and they can easily relate to what you are talking about. Blogging involves lots of content creation. It doesn’t matter what type of content you create, your content creation process will involve a lot of writing. Even if you don’t publish that much written content and let’s say you are all about making videos. You still have to write the script for your videos, social media updates, newsletters and much more. So train yourself to become a prolific writer. People need variety these days so they are not bored. Also with a variety of content you can cover readers whose interests are varied too! For instance, instead of simply publishing text form posts, add videos, podcasts, slides, infographics into the mix. This way you can make your content highly engaging, visually appealing and entertaining. Plus you can reach out to audience in a variety of ways/places (like Youtube, Slideshare, iTunes etc.). This is something very serious. Not setting up your site properly can tamper your SEO efforts, can interfere with user experience and loading speed. So I highly suggest you that you first make the basic set up totally right. If you are using WordPress, here is a list of things that you need to do immediately after installing WordPress on your website. Also please refer to Chapters 3 and 4 of the How to start a blog guide! #30. Don’t EVER indulge in black hat SEO techniques. Ever. With black hat SEO techniques you just complicate SEO. SEO is not at all complicated. It is quite easy these days and you just have to stick to the basics. You don’t have to spend a ton of money on SEO to build links or whatever. And Google hates being manipulated. With all the efforts and money spent to do black hat SEO, you will only reap penalties and slaps from Google rather than a SEO boost. Never ever waste your time and money on that! Navigation in a website plays a crucial role in helping both readers and search engine bots. If you don’t have a clean and clear navigation your readers will be left confused. And yes, they will leave! Your website should have a clean navigation so any page on your site (not the blog posts) can be reached within 2 or 3 clicks. Jargons don’t work all the time. Especially when your website helps beginners, jargons are best avoided. Even for advanced visitors, some jargons might work and some might not. So keep jargons away and use simple language to talk to your readers. Do not use too much hype or too sophisticated language on your blog post titles – they can be misleading, confusing and many people simply won’t understand. And if that’s the case they won’t click through to check out your content. Even while they are reading your content if the language you use is complex, your readers will simply leave. A fast loading website keeps search engines and your readers happy. People are busy and they won’t wait for your slow loading pages to finish loading to read your content. They will simply click the back button and seek the same information elsewhere! And too many click backs like that contribute to a high bounce rate which is not good for SEO. Also search engines do not favour slow loading websites in their search engine result pages (SERPs). Many people are switching to accessing the web via their mobile devices. This includes smartphones (of various screen sizes), tablets, portables and the like. People read a lot while they are on the go rather than working on the table. So you need to make sure that your website is responsive – that it appears neat and clean in all screen sizes. Most solutions like Genesis and Thrive themes offer you with responsive themes. Blogging is not easy peasy. If you were told so, you’ve been cheated. It takes a lot of hard work and persistence to get there. And in the meanwhile you are prone to get demotivated and lose track of your goals. In order to avoid such negative stuff, prepare yourself right from the beginning. Know what it takes to become a successful blogger. And be prepared. Blogging tips for you to succeed. There you go! Alright, I am pretty sure I’ve covered the essentials here as blogging tips for beginners. In addition I strongly suggest you to check out the How to start a blog guide. Good luck with your blogging journey and I hope these business blogging tips will help you in the long run. Love ’em all! #18 is really, really big. Write in your own voice. I pen/write 1000 words daily – or more – to let my voice out. Like a chained, tortured soul, our voice hides within, cowering, until you practice writing, to let it out of the cage 😉 Thanks for sharing! Hi Jane, I am a loyal reader of your blog from the very first when you moving from the janesheeba.com to Savvybloggingtips. I always got valuable tips by reading your posts. About blogging, as a beginner I think blogging tools is the most important things that maximum new comers are missed to use. I know there are many monetization options are available, one of them are ads. A beginner blogger firstly try to monetize his blog by this way, and this is the fatal mistake they do with their blogging career. At first six months all bloggers trying to get approved by adsense and lost their valuable time into it. Simple equation, If your daily unique visitors are around 1000 and your CTR rate is 1click/1000 and the value of your CTR is $0.50 than you will earn only $0.50 at the end of the day. Isn’t that too small against your effort?! As every business needs some investment, if a blogger wants to earn by blogging he needs to invest some money. You mentioned some paid tools here which are really effective at the beginning. A healthy email list can pay you far better than $0.50/day. I wish you’ll write an article on those matters to aware new comers not to run for adsense blindly and try other effective ways to monetize their blog. These are some awesome blogging tips for Beginners. The points mentioned here are actionable tips that will help improve traffic on a website. Learned a lot of new techniques from this article and I am looking forward to more such blogs. Great information, I really learn a lots. This post is both massive and massively useful. Perhaps my favorite is #2, as this is where most beginners tend to fail. It’s tempting to just start a blog and go with the flow (in other words, publish post after post after post – letting the traffic build passively and indirectly). But an action plan, in my opinion, is what leads to eventual leads, eventual traffic, and eventual sales. This is the best article i have read for beginners. I’m new to blogging and I’m going to follow every step. Thanks a lot.